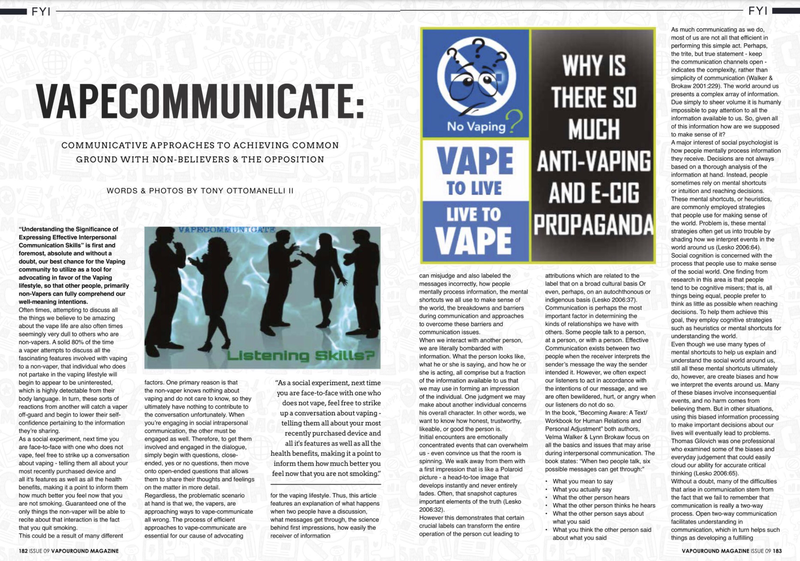 Page 2 – Who Are The Vapers? 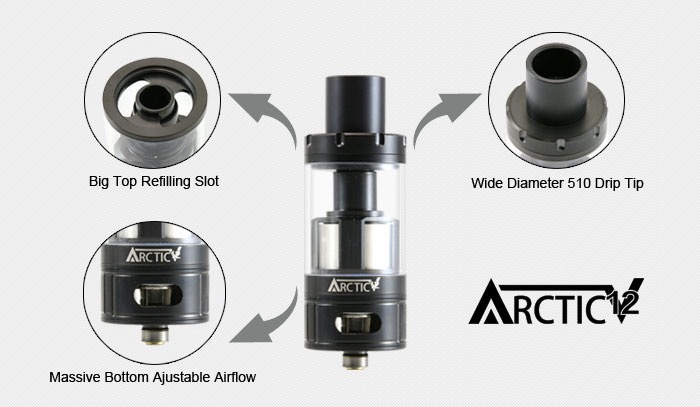 Many often fail to realize before the Cloud Beast was a tank offering 8 separate coil options which referred to as the Arctic V8 tank made by Horizon Tech. Just over a year later, as the Cloud Beast King came on the scene, Horizon Tech released their own upgraded V8 known as the Arctic V12. If a consumer were looking for milky cloud production as well as tasty distinct flavor, typically an RDA was the top piece of choice and perhaps it’s still is, after all there’s nothing like dripping on a fresh build that you are somehow very proud of because you took your time and did something constructive and practiced the safety precautions necessary for being a responsible adult vape enthusiast and hobbyist. If you know how-to build your coils for RDAs or RDTAs, then you are a hobbyist and enthusiast whether you identify as one or not. It is an impressive microcosm within the vaping lifestyle requiring the skills necessary to exert mental spend much of your intense concentration. 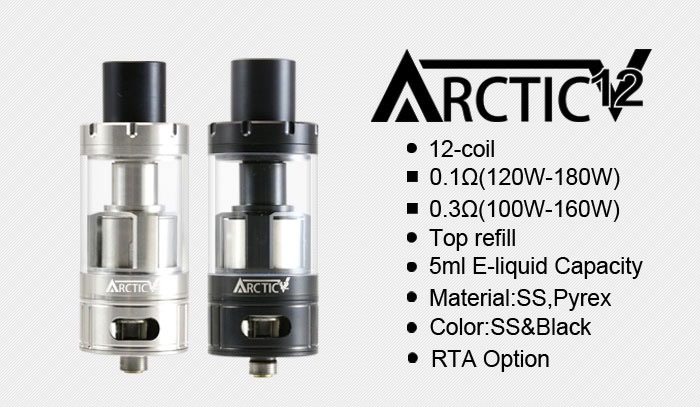 It is definitely one of the most popular tanks around, also the choice of a vast selection of coil options could this be considered an innovative fours which allowed the consumer to experience the of an RDA but from a tank? Some say so. Horizon Tech provides suggestions in the manual which essentially serves as a Troubleshooting guide that is most certainly helpful. For instance, it states, “Losing flavor or clouds? Time to change the coil. Make sure the coil is compatible with your tank. Coils have no set life span. Keep the coil in its protective packaging until ready to use. Clean your tank when changing the coil to maximize flavor. When I used the first coil that came already screwed into the atomizer base of the tank, there were certainly some major leaking issues that became quite frustrating. Every time, I’d refill the tank, it would simply ooze out the airflow holes at the base of the tank. However, I remembered to make sure the 510 male and female parts were not overly tightened and then primed the coil. 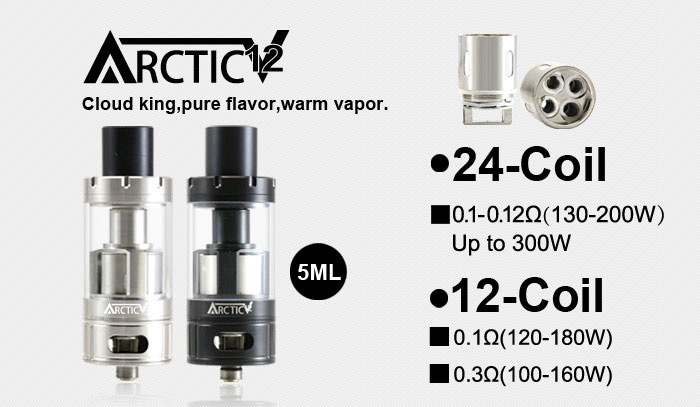 Everything recommended was performed – this was going to be a great tank experience as the Arctic V8 was the originator of great flavor, consistently perfect cloud production, and a multi-selection of coil types like the Tiger coils, Hives, Claptons or even Snake Coils. So, I was certainly looking forward to this experience. The first couple pulls were smooth, flavorful, thick cloud producing – but something felt weak, as if there should have been a quick draw mouth-to-lung experience. Perhaps the triple battery iJoy mod was not cutting it. Switching to my Sigelei Fuchai 213 was by far a much different experience. Most likely because of the setting option for “Preheat Power Adjustment” on the 213 mod is brilliant innovation, allowing the user to choose how quickly the Mod could power the tank and what temperature you would prefer that it reaches – I have this currently set at 100 watts in 0.10 seconds. It’s quite overzealous for such a request on my Sigelei Fuchai 213. But everyone has different preferences. Regardless, it seemed this tank might just perform differently with each mod. Thus, the experimenting began. 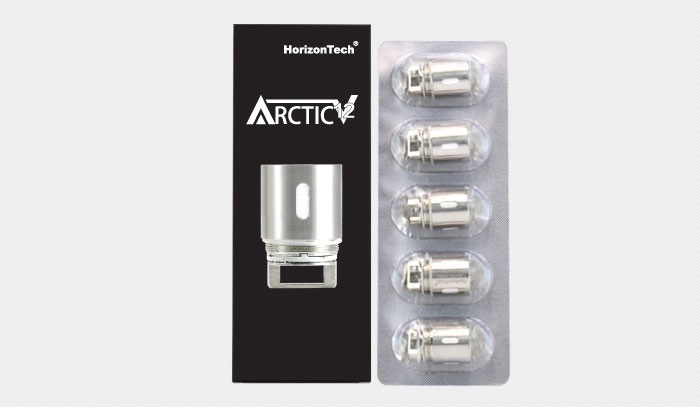 The Arctic V12 tank by Horizon Tech is specially stylized and highly technical. Considering this, technically speaking, it is a “Sub-Ohm resistance atomizer” and only work on devices that can handle Sub-Ohm resistance of 0.5ohm or lower. Please make sure you have an understanding that requires some technical knowledge on how to use high-powered mods and lithium-ion batteries. Do not use short or flat 510 connection on any hybrid or hybrid style device. If you are not familiar or unsure of particular products or set-ups, please do not use it. Always follow instructions and learn as much as you can about the product before using it – watch YouTube tutorials and reviews, ask friends who are also vapor product consumers and communicate the do’s & don’t’s. Keep an open mind – read more than one review, as many reviews have different interpretations. Take all the appropriate precautions before handling and make sure to vape safe and vape often. Vapor advocates began to read the Legislation introduced to the House of Representatives by Rep. Duncan Hunter and were very pleased, but further research into the details of HR 2194 causes some concerns to arise. It was only a matter of time before we saw some type of speculations brought up by Vaping advocates. Those concerns are certainly understandable, but also could be easily corrected by Hunter to please the Vape Community. In the initial text of this HR 2194 bill which was very recently introduced to the House just days ago. With overwhelming support coming from AEMSA along with the Electronic Vaping Coalition of America (EVCA). Regardless, it’s still essential to hear everyone’s interpretation – whether they represent an organization or just themselves as an individual. 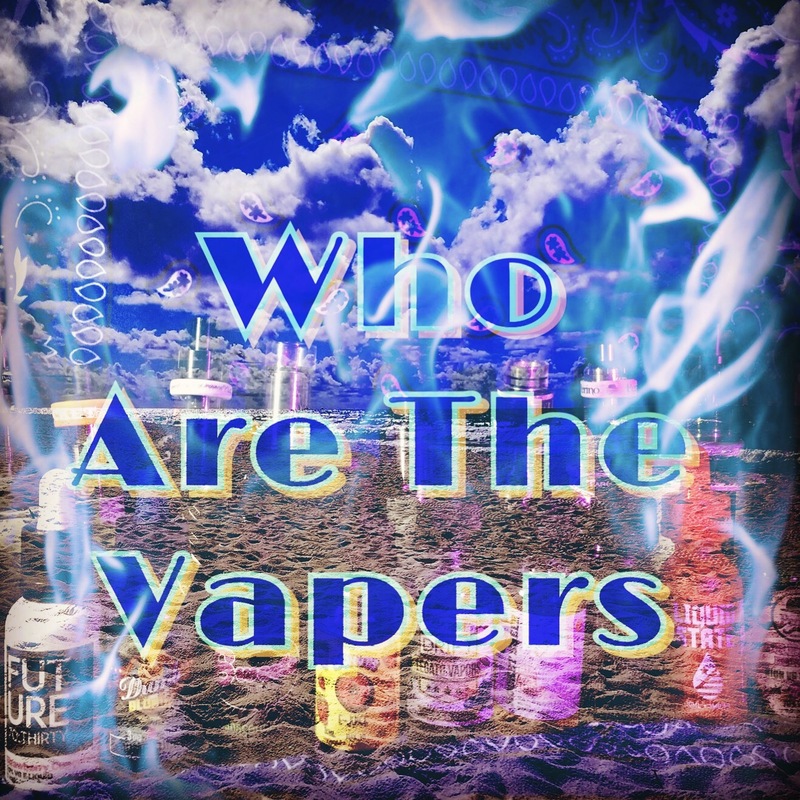 Furthermore, Vape Advocates have voiced a number of concerns about this new “Replacement” initiative set in motion by more parties than simply Representative Duncan Hunter. It’s been a team effort indeed that has built this legislation. After questions are asked, many advocates shared their concerns from individual conversations over the past few days. “Repeal” and “Replace” are 2 words U.S. Vapers have been hoping to hear, so this process of doubting such Legislation is not enjoyable, but asking questions is always necessary. Why would this repeal & replace proposal be cause for concern? Let’s just say these advocates, from all walks of life, have always been thorough when analyzing the fine print and always had the industry’s best interest in mind as well. Before speculation takes over your mindset, we must first reflect on what individual advocates have to say about what they found in their research. What is uncovered is crucial to reflect on even further, here is what one advocate, who chooses to maintain anonymity had to say about Duncan Hunter’s Legislation. “SEC. 1003. PROHIBITED ACTS; PENALTIES. (d) Penalties.—Any person who violates a provision of subsection (a) shall be imprisoned not more than 3 years, fined not more than $10,000 (notwithstanding section 3571(e) of title 18, United States Code) for each day on which the violation continues, or both. Pause. Sigh. Wait a minute. What? Well, that is exactly what is stated in this bill and it is all surely a cause for concern. Jail time for DIY? That entire concept is outrageous and absolutely unacceptable. As Vape advocates jump on the Duncan Hunter’s HR 2194 bill “Bandwagon,” please be advised to read the legislation in it’s entirety. It’s not too much fun when reading H.R. legislative bills and often these proposals made by political servants are vague and misleading – creating mass confusion and misinterpretation. Yet, a thorough examining of the details is necessary. Clearly, politicians do this as a strategic move in order to allow laws to be made that will more than likely create an advantageous situation for financial interests. Be patient because understanding everything the “replacement regulations” have to offer is just as important as what it could be taking away. Many Vapers and especially advocates would settle for anything the community can get to counteract the FDA regulations at this juncture. Any replacement would be better than what is currently installed by the FDA. However, if we’re going to go for a complete overhaul of the current FDA overreach, we must guarantee it sets safety standards of course, but we cannot allow a replacement of 18650 battery devices. Not to mention, there are countless DIY professional and hobbyists who may not be too keen on the idea of a possible fine and jail time for continuing their business. It is absolutely crucial to remember the Cole-Bishop legislation is not dead, it is still alive and well. So, the Cole-Bishop HR 1136, the standalone bill is still certainly a possibility for October’s Federal Budget via negotiation/vote. Things are never as they seem, especially in the American political arena. While the HR 2194 bill may paint a pretty picture, it may also be too much of wishful thinking. Is there far more vague language included in the bill that we do not see at first glance? Then again, while there are some stipulations in the Hunter Legislation that many Vapers would not agree with. One thing we could all appreciate is that it would rid our Industry of the nonsensical FDA deeming rule – allowing tens of thousands to remain employed and small businesses will no longer fear their livelihoods becoming ex. Thus saving the Industry from prohibition. Well, that sounds like an honest approach, Mr. Block makes a great point. So if you are a vaper and especially an advocate, then do what you do best: make some calls and make some demands before it is too late. This legislation would be a perfect solution minus those particular features of concern. So pick up the phone…now. No matter what the true reason is for the timing of this legislative move, for the sake of maintaining unity and avoiding drama, let’s just assume this bill was introduced directly following the exclusion of Cole-Bishop from the Federal Budget out of pure respect for all those involved with laying the groundwork surrounding HR 1136 that had already built a strong momentum towards progress. Is it likely that this legislation could all merely be “hype” and nothing more? Or, is it becoming a representation of “hope” for U.S. Vapers and all the speculation should become nothing more? In hindsight, Hunter’s plans and ideas that he and his constituents are propose, expose and impose are noble regardless of the intent? If no one will, we will continue to be heavily regulated still. With mass amounts of misinformation being spread around the world, claiming the risks of Vaping are the same as the dangers of smoking, it seems some people are willing to take advantage of an already injured industry – an economic scapegoat, the vapor industry. 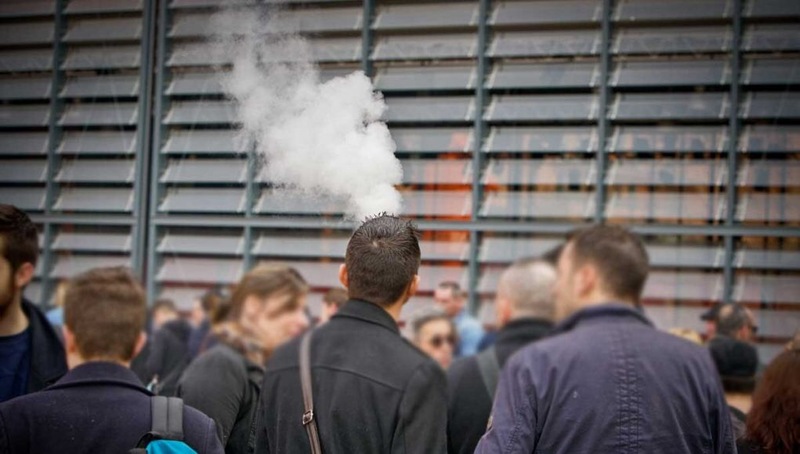 Specific Law Firms are putting out ads targeting people who have experienced what they refer to as “eCig explosions” when in reality, the unfortunate incidents deal more with battery malfunction. These Law Firms are proving these cases to be lucrative pursuits, which can be risky public knowledge given that so many are in need of financial relief. Just around this time of year, only a couple years back, it could be said that the American Dream had been reestablished in the name of Vapor. Over the past 5 years, the U.S. saw vape shops popping-up all over the major cities. Not to mention, it seemed everyone knew at least one other person starting their own juice line whether you vaped or not. Opening up vape shops with the intentions of educating others on their harm reducing benefits. All in all, the working class freed themselves from being slaves to Corporate America & Big Tobacco by following what they experienced as a miracle. The lifestyle of vaping allowed them to quit years of smoking, nothing had ever worked so well before. This needed to be shared and the people needed to be made aware. Thousands quit their dead-end jobs where they worked just to keep food on the table and followed their hearts and instinctively found their calling. Opening up vape shops with the intentions of educating others on their harm reducing benefits. Therefore, they put themselves back to work by embracing their entrepreneurial spirit and small becoming business owners. Now, at this moment in time, the independent U.S Vaping Industry is facing the toughest year since it’s existence. Why? Because the FDA has taken upon themselves to install a prohibition on vapor devices – states are imposing excise and wholesale taxes on all vapor related consumer products, as well as local municipalities. It is clear that Vaping has become a target for extinction, despite the overwhelming evidence of its harm reduction capabilities. Sadly, this also means nearly 8K Vape shops will be forced to close Nationwide along with small business owners losing their livelihoods, so will approximately 40,000 jobs (assuming there are 5 people working at each shop, which in most cases there are more than 5). Hopefully, in a society where moral duty is sensationalized, extinction is not exactly what will occur, but the future of vaping appears cloudy and tragically unforeseen. The Vaping Post covered this topic in great detail in a brilliant article. Battery safety is by far a huge concern for the community. The industry is taking these scenarios and possible malfunctions as a very serious measure and treat it as an unfortunate drawback. The most important safety precaution in reference to vaping devices and companies, big and small have been on a mission to better educate consumers on how to take care of their equipment and accessories, namely lithium-ion batteries. Nearly every shop promotes battery safety. For any vape-related business owner, the most important safety precaution on their minds and now a vital portion of their agendas is to continuously educate consumers regularly on this issue. 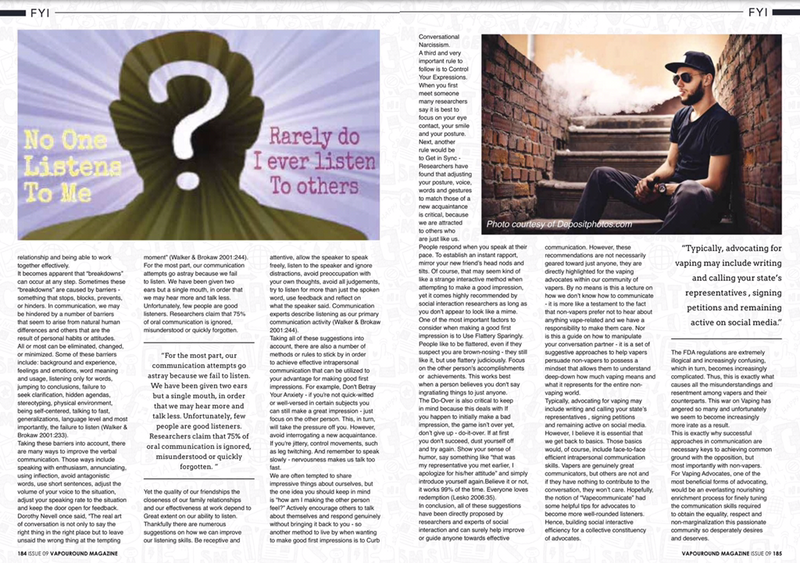 The vape community, especially those vapers with 2+ years experience, fully understands this is a delicate topic and if any individual were to experience such a dangerous situation, a large majority of vapers are genuinely sympathetic and disappointed. It is never a good idea to have other loose metallic objects next to your unprotected lithium ion batteries while in an enclosed space. However, the recent influx of sudden unexpected batteries malfunctioning,, is causing more skepticism about vaping among wider society. Most do not realize these accidents occur due in large part from user error. Often times, these things happen even if you’re not deliberately attempting to use the device as it rests near your keys or loose change in your pocket or perhaps your purse, fanny-pack or tote bag, depending on your preference for fashionable accessories. It is never a good idea to have other loose metallic objects next to your unprotected lithium ion batteries while in an enclosed space. Nevertheless, the incidents are overly-reported and slightly exaggerated by the media and quickly nullified by the public far more than is necessary on television, as these circumstances are very rare and hardly occur. As a matter of fact, statistics prove that the Droid cell phones were overheating and catching fire at a rate much faster, than vapor devices ever have. Meaning more devices were compromised in the short span of time they were available to consumers before they were recalled. Yet, the Samsung Galaxy Note 7 is not the only culprit of having lithium ion batteries prematurely degassing. These scenarios are highlighted in the brilliant article covered by the Vaping Post this past November. The article clarifies that these incidents are not only occurring with vapor devices, but pretty much any type of device using lithium ion batteries for power seems to have identical malfunctions. The article states, “Smartphones, tablets, laptops… you probably also remember the cases of some Hoverboards, the electric skates consumed by flames. More spectacular even is the case of the famous electric vehicle Tesla that caught fire in Biarritz, during a promotional summer tour in France, last August 2016. The same story that happened a few months earlier in Norway. At the same time, if these incidents involving exploding lithium-ion batteries somehow do occur and someone then becomes a victim, figuratively speaking – they are either advised or already planning to seek legal counsel. Speaking more literally, it is a higher probability that the device, itself is, in actuality the real victim, as all of these unfortunate scenarios have involved some form of user-error and battery malfunction. Nonetheless, some attorneys have certainly been known to target scapegoats for quick cash. It is safe to say that those within the vapor industry are undeniably vulnerable. Some law offices are now making this unfortunate scapegoat of rare danger their primary focus for their law practice. Naturally, human beings are emotional and thrive off dramatics, often enjoying attention. Not to mention, given the way in which our economy is structured, human beings often enjoy making lots of money especially when nothing was officially accomplished. Therefore, many of the people who have these battery malfunctions, immediately seek legal counsel in which they are, in most cases, a guaranteed victory of receiving compensation. One example would be Attorney Marc Freund, who is quoted as saying, “What’s unconscionable is that a device marketed around the world as safer than smoking actually poses immediate health risks.” This is an undoubtedly inaccurate and biased statement – purely an attempt to disguise vapor devices as dangerous rather than harm reduction tools. A woman in California was awarded $1.9 million in one of these cases. Though, this is not an attempt to discredit any injured individuals as most claims seem legitimate and truthful. Although, do keep in mind that a woman in California was awarded $1.9 million in one of these cases and we all know that plenty of American citizens abuse their right to use the court system and who would take advantage by doing something like this for that amount of money. Yet, please understand this is not an accusation aimed at that particular case. Not just Americans either, it is very likely plenty of people around the world would partake in such an activity to personally receive a million dollars when in reality they are actively destroying the reputation of an already marginalized industry. This is a prime example of another money-making scheme by attorneys based on the downfalls of a singled-out, scape-goated precaution of the vapor industry. Thus, businesses are allowed to operate as long as they take money away from the Vape industry. By no means is this a suggestion stating that all vapor device malfunction incidents that lead to judicial review or legal disputes are fraudulent. Not to mention, there is extreme sympathy felt for anyone who may have experienced this issue. However, this article is more of a precautionary warning for manufacturers to keep an eye out and ear open for the smallest sign of any foul play or suspicious activity. Gambling by opening a small business with the intentions of helping others quit a deadly habit is indeed commendable. That was the American Dream after all – make a living doing what you love and believe in and help as many people in the process. At least that’s what we were raised to believe life could be in America, but unfortunately we all must find out the hard way that “things are never what they seem.” A quote that should be used in these court room battles over “ecig explosions” due to the fact that though it may seem as if an ecig exploded, in actuality malfunctioning. Who knows the truth when there is so much suspicion and doubt?